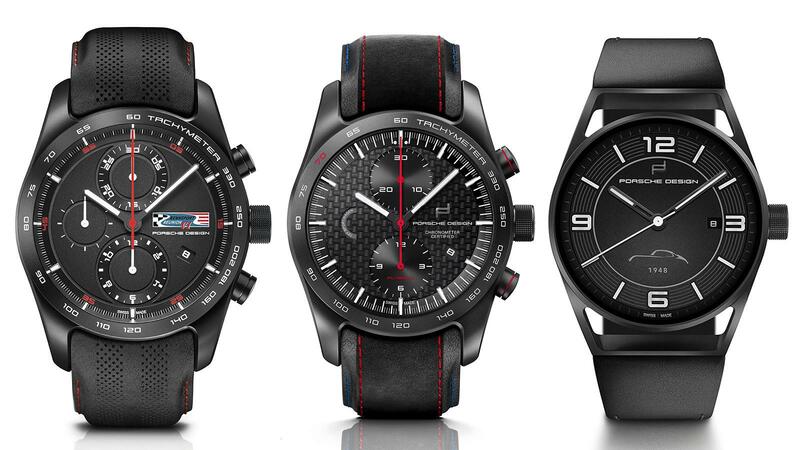 From left: Porsche Design's Chronotimer Rennsport Reunion VI Limited Edition ($6,800), Chronograph 70Y Sportwagen PCA Edition ($9,911) and 1919 Datetimer 70Y Sports Car Limited Edition ($3,405). Tens of thousands of Porsche enthusiasts gathered in Monterey, California, last weekend for the world’s largest Porsche passion party, the Rennsport Reunion VI. The event, held at the WeatherTech Raceway Laguna Seca, showcased vintage and current racecars spanning the marque’s 70-year history. In addition to the scores of Porsche owners and fans, several legendary drivers were also in attendance, including Hurley Haywood, Jacky Ickx, and Derek Bell. Porsche Design, the luxury accessories branch of Porsche AG, commemorated the event with a limited-edition watch, the Chronotimer Rennsport Reunion VI Limited Edition ($6,800). Limited to 70 pieces in a nod to the marque's 70th anniversary this year, the numbered chronograph pays tribute to Porsche Design’s Chronograph I, the piece that launched the Porsche Design brand in 1972, eight years after its founder, Ferdinand Alexander Porsche, designed the iconic 911. In retrospect, Chronograph I was far ahead of its time with a matte black titanium case and black dial with high-contrast white hands and indexes. The Rennsport Reunion timepiece features the colorful event logo on its dial and case back. Red and white markings on the minute track echo racetrack safety sidelines, and the black calf-leather strap is stitched in red, like the original Porsche interiors. The event also offered to the public, the few remaining numbered pieces of a Porsche Club of America member’s exclusive, the Chronograph 70Y Sportwagen PCA Edition ($9,911), also limited to 70 pieces and available online. The watch is powered by the brand’s first in-house proprietary movement, the COSC-certified Werk 01.200 with Flyback function. Earlier this year, Porsche Design introduced the 1919 Datetimer 70Y Sports Car Limited Edition ($3,405) to mark the anniversary and pay homage to Porsche’s debut model, the Porsche 356, a direct ancestor of the 911. That special edition is limited to 1,948 pieces and takes design cues from the 356’s dashboard. The matte-black dial features radiating rings and a silhouette of 1948’s curvaceous 356. The form-follows-function Bauhaus design aesthetic is a Porsche Design mantra echoed throughout the brand’s watches and fashion accessories.